Expert TA now offers a complete set of automatically graded homework questions for Investigating Astronomy. Expert TA has become the homework platform of choice for Introductory Physics. The Astronomy offering will leverage many of the key features of the Expert TA system, including automatic grading, hints and feedback, advanced graphical questions, and a complete academic integrity tool suite. 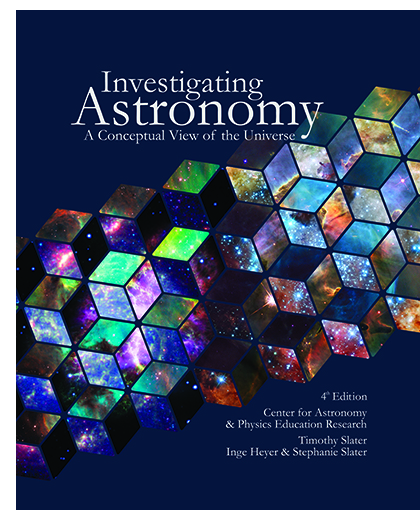 About the Book: A Conceptual View of the Universe is a total astronomy teaching and learning package. Based around the innovative textbook Investigating Astronomy written by Timothy F. Slater, Inge Heyer, and Stephanie J. Slater, cleverly illustrated by Alex Richard of DarkHorse DesignWorks, the complete Investigating Astronomy Toolkit includes a colorful printed textbook, an interactive Kindle e-book, a theCN.com-based learning management website, and a frequently updated website including homework tasks and classroom-ready instructor resources. This learning system leverages the latest results of cognitive sciences research on how students learn science. Product Details: Subscription to the ExpertTA Investigating Astronomy homework system includes additional automatically graded homework questions that can be assigned to students that are in addition to resources provided by the textbook itself.